Just in case you ever worried about meat being in your water – mmmm, steak water, yummy, right?! – you can rest easy, Hint Water has a (ridiculous) label for that. 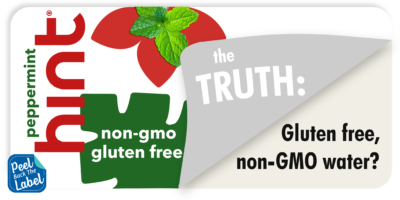 In fact, on the back of each of their bottles they include one long stream of nonsense, for anyone grounded in reality: “hint is vegan and free of sugar, sweeteners, MSG, nuts, soy, gluten and preservatives.” Top that off with an unnecessary ‘Non-GMO’ label and you’ve got a bottle ripe for ridicule – and consumer confusion. Last time we checked, fruit essence and good old H20 – the two ingredients in Hint water – don’t have gluten, nuts, soy, MSG, animal byproducts, preservatives, or GMOs to begin with. Hint has jumped on the deceptive food labeling bandwagon in an attempt to differentiate itself within today’s sparkling water craze. With Pepsi, Coca-Cola and other companies rushing to meet consumer demand for healthy beverages, the market for seltzer and plain old bottled water is starting to get crowded. Instead of being truthful and transparent in their advertising, Hint plasters misleading labels on their bottles (even when their product has never contained the ingredient they want people to fear) to try to set themselves apart. Take a hint, Hint: you can do better. Tell Hint you’re not buying their labels on Twitter, Facebook or email today.